First, let’s talk about discovering the baseline of where your rink stands with an aging building audit. Many rinks simply do not have a plan to care for the building, the rink, the refrigeration system, or the facility as a whole. 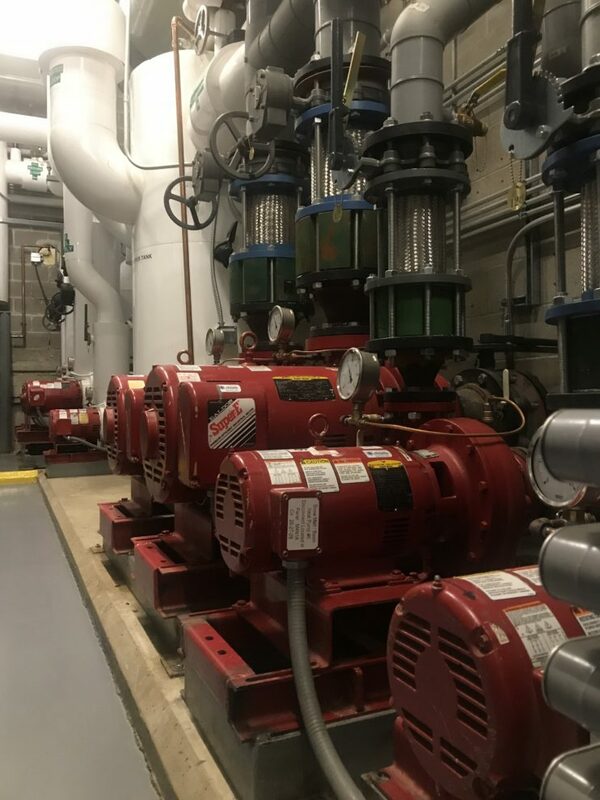 Over time, if not cared for, a refrigeration system upgrade ultimately creates a budgetary stress down the line that is often a shock to a town or collegiate board’s budget. An aging building audit can help eliminate that stress and provide an assessment of the facility allowing the town’s management or collegiate board a plan for upgrades. An aging building audit is a formal study that will include the detail you will need encompassing all aspects of the building’s mechanical system, structural elements both inside and out, electrical status, and of course your refrigeration system including the compressors, pumps, electrical distribution, and condition of the refrigeration floor. As a leading ice arena refrigeration contractor, Preferred Mechanical Services has decades of experience to assist you in assessing the integrity and future expectations of your refrigeration plant and ancillary equipment, your arena floor (be it sand or concrete) and your dasher board system. An example of an aging building audit, as prepared by Preferred Mechanical Services for the town of Hartford, MA, can be seen here. Hartford’s Wendell A. Barwood rink has chosen to upgrade their refrigeration system to Emerald Environmental Technologies’ ice3 Cube System, you can read the Wendell A. Barwood case study here. Emerald Environmental Technologies has built their ice3 Cube Systems in modular units, for many reasons including accessibility, mobility, flexibility, portability, and maybe most important of all – future growth or upgrading and ease of future budgetary planning. Let us explain. The ice3 Cubes are built into modular designs that fit through standard doorways so that an entire ice3 Cube System could be built and designed on a second floor such as the University of New England Alfond Center (and incidentally so quiet that no one would know in the conference room next door). The ice3 Cube System’s modular design allows a facility to upgrade by adding more cubes should the facility grow its business or expand into other seasons requiring more air conditioning, dehumidifying, or more ice. Finally, because the ice3 Cube System is built in modular components the municipality or collegiate board can plan two or three decades in the future to replace one cube at a time as needed – allowing solid budgetary planning. Instead of getting hit with the need to replace an entire refrigeration system twenty-five years in the future, planning to replace one cube at a time is much more palatable and budget friendly. Just slide the old Cube out and slide a new Cube in. When comparing the ice3 Cube System to an older system that is in constant need of rebuilding every three years, constant maintenance to drain oil and add refrigerant, testing and readjusting solutions… the choice is clear. The ice3 Cube System is an easy, clean, environmentally sound, and budget friendly choice. In the last ten years great strides have been made providing options to incorporate heat reclaim resulting in fantastic maintenance and cost savings. If your rink was built more than two decades ago, consider an ice3 Cube System upgrade. Potential energy rebates and the reuse of waste heat can create a refrigeration system that was once a system that required constant babysitting and drained your facility’s resources and budget into a safe, quiet, nearly maintenance free, cost conscious ice3 Cube refrigeration system and when Emerald Environmental Technologies’ ice3 Cube System incorporates heat reclaim, now you have a net zero system– and that’s the most bang for your buck. Looking for an aging building audit for your rink? Email John Meade at Preferred Mechanical Services or call 781-293-1200 for more information. Preferred Mechanical Services is an experienced installer of ice3 Cube Systems working hand in hand with Emerald Environmental Technologies.